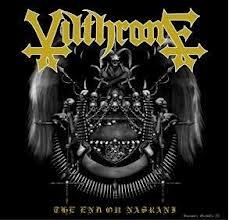 RANDOM: VILTHRONE "The End Ov Nasrani"
VILTHRONE might be a rather new, recent band; but the personnel behind must have been engulfed with the underground Metal extremities for quite a while. This is to be confessed upon listening to "The End Ov Nasrani", the debut release from this, I'm quite sure; devastatingly emerging Malaysian black Metal act. Herein lies three precise desecration of European influenced fluid, sleek black Metal lacking none of its vital characters. The seamless flows and executions clearly indicates the vast abilities of the band members as I have suspected. There certainly is no need to be otherworldly or ever out-there to stand out from the herd if the essence is within the deeper conscience, for the channeling will be right where it ought to be. You already know what to expect, but you won't be complaining about it either. VILTHRONE decapitated all the right heads effortlessly. Even when they go for a bit of dirge like the second track, VILTHRONE confirms to the limits and the shards and shapes of their compositions are a landscape well endowed for them. Convincing and deadly. Herald the coming, as the sigil on the cover has warn you.